The 3D 1950's style woven throw rug model in Poser 3D model format. A 3D artificial Christmas tree model in Poser 3D model format. The 3D baby hygiene product container models in Poser 3D model format contains a baby powder container, baby shampoo container, baby lotion container and a baby oil container model. The nine model 3D Christmas holiday models bundle for Poser and DAZ Studio contains an artificial Christmas tree model, a tree skirt, three wrapped gifts to put under the tree (you can change the gift templates to make more gifts). Also included is a holiday wreath (only available in the bundle), a holiday holly model (only available in the bundle), and two Christmas stocking models. The 3D Christmas stocking models in Poser 3D model format contains a green and a red pattern stocking. The 3D Christmas tree model add-ons in Poser 3D model format contains a tree skirt and three gifts to put under the tree. You can modify the textures to create multiple gifts. The 3D cleaning product models in Poser 3D model format contains a carry-all, four cleaning product containers, a sponge and a sponge on a handle. All items are parented to the carry-all and may be used independently of each other. A 3D handheld can opener model in FBX 3D model format. Contains 28,162 polygons. The model has rotation axis set where needed. The 3D kitchen can opener model is in FBX 7.1 3D format (2011 binary, embedded textures). FBX format 3D models import seamless into Unity 3D, Lightwave, 3ds max, Cinema 4D, Maya, Blender, Shade, Modo, iClone, and other 3D modeling software that supports FBX 7.1 file format imports. Most 3D software created since 2011 should import the 7.1 binary format without any issues. 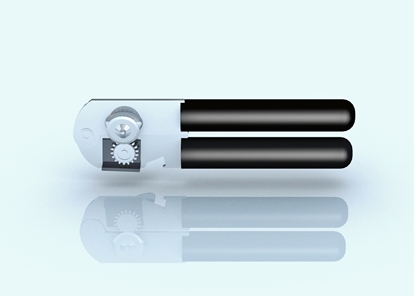 A 3D handheld can opener model for Poser and DAZ Studio in Poser 3D format. Contains movements to open opener and a movement to turn handle/gear. 3D modern candelabra model in Poser 3D model format. The 3D trash can and trash bag models in Poser 3D model format, contains a new and rusty can with handle movements and lids that open. Includes a closed and open trash bag models. 3D Victorian Travel Case model in Poser 3D model format.